There is something magical about meringue. The process of whipping liquid egg whites into a sugary pillow-like mass is not just satisfying, but fun. From cookies and marshmallows to frosting recipes such as this, there are multiple uses for shiny sweet meringue. Despite whatever the intended purpose, I can’t seem to resist dipping my fingers into the bright soft fluff and eating most of it before it makes it out of the mixing bowl. This meringue frosting recipe, inspired from “The Art of Fine Baking,” is really just a basic Italian Meringue: the egg whites are “cooked” by beating in a water sugar mixture that has been heated to soft ball stage (238 degrees). This process creates an extra shiny thick meringue, which is all the more irresistible. Butter can also be added to create a meringue buttercream. I skipped this step because I personally don’t think the frosting needs butter. The greasy addition also makes it much easier for the meringue to break down and create a soggy mess. But enough about meringue, let’s talk cake. I know I need to be more open minded but whenever I make a cake, it usually has a chocolate component. 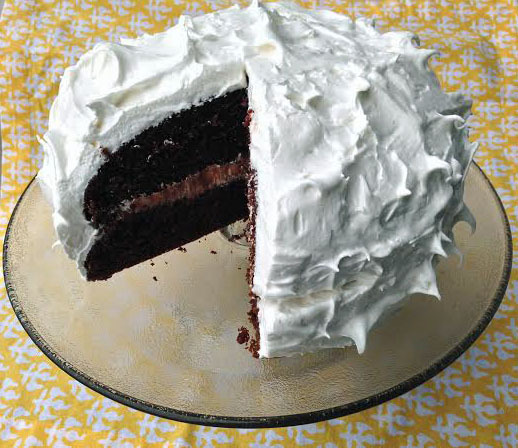 In this case, the cake itself is chocolate since the meringue frosting is not. I also took it one step further and added melted chocolate to a small amount of the frosting for a chocolate surprise in the middle layer. This of course is optional. The cake is a Red Devils Food Cake recipe that I adapted from “The New York Times Cookbook“ by Craig Claiborne, a good friend of my grandmother. It’s a basic chocolate cake with just the right amount of moistness. Paired with the meringue frosting, it becomes impressive and indulgent. I dare you to eat just one slice. Preheat oven to 350 degrees. Grease the bottoms of two 9-inch layer cake pans, line with waxed paper or parchment paper and grease the paper. Sift together flour, sugar, cocoa, soda, and salt. Add the oil and 2/3 cup of the milk and mix. Beat two minutes. Add remaining ingredients and beat two minutes longer. Turn the batter into the prepared pans and bake on the lower shelf of the oven until the cake springs back when pressed lightly in the center, 30-35 minutes. Cool the cake in the pan five minutes. Turn out on rack, remove paper, and frost as desired. Combine 2/3 cup of sugar with water and corn syrup in a saucepan. Stir over low heat until sugar is completely dissolved. Raise heat and boil syrup without stirring until a candy thermometer reads 238 degrees, or a few drops of syrup form a soft ball in cold water. While syrup is cooking, beat egg whites with pinch of salt until they form soft peaks. Gradually beat in vanilla extract and remaining sugar, a little at a time, until whites are firm. Pour boiling syrup in a fine stream over whites, beating constantly. Continue beating until completely smooth and stiff. Cool. I just made this cake and the white meringue icing. Totally delicious, my husband loved it! That’s great! Thanks for the comment and sorry for the delayed reply.